Can't get enough of these Virgil beverages, eh? I'm not a fan of cream soda, but I don't hate it either. I guess that makes me indifferent to it. One of my main complaints of cream soda is that it always has a stickiness. 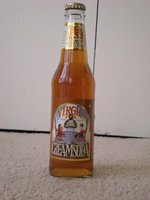 Thankfully, like all Virgil's products, this is a very clean, crisp soda. Meaning no stickiness. In case you didn't pick that up. The bottle boasts "micro brewed with real vanilla beans," and that comes through abundantly. It's a very potent vanilla flavour. This is an extremely sweet beverage to the extent that the best way I can describe it is that it literally makes me smile as I sip it.